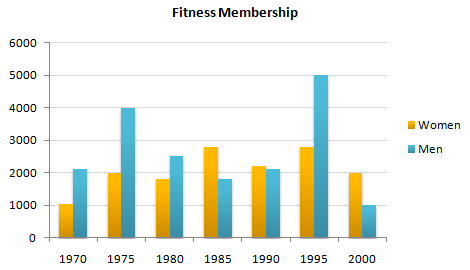 The chart below shows male and female fitness membership between 1970 and 2000. The chart shows male and female fitness membership over a thirty-year period. The vertical axis represents the number of members. The horizontal axis represents the period from 1970 to 2000. Overall, the chart indicates that there were greater fluctuations in fitness membership among men than among women. The number of male members started the period at just over two thousand and reached highs of four thousand in 1975 and five thousand around 1995. The lowest rates were in 1985 and more recently in 2000 when the rate dipped as low as one thousand. Female fitness membership began lower at one thousand, doubled by 1975, and then fluctuated between two and three thousand for the remainder of the period. When male rates were at their lowest, female rates were higher. This was particularly true in 1985 when over three thousand women held fitness membership. In brief, there were marked differences in rates of male and female fitness memberships in the period covered.